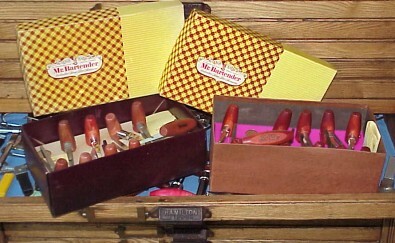 Here are two boxes full of the "Gourmet Cork Puller" from the Mr. Bartender line of bar accessories. The box on the left is from the days when the company was located in Torrance, California (1960s and early 1970s). The box on the right is from the Florence, Kentucky days where it died in the 1980s. The company also marketed the product as part of the "Party Pals" line on blister pack cards. 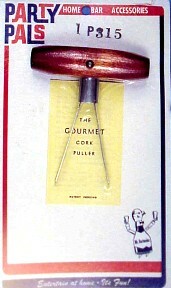 Three versions of the Gourmet. 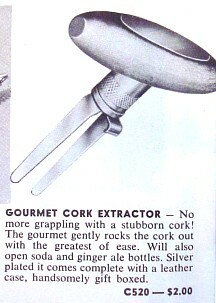 An earlier version of the Gourmet included a bottle cap lifter at the top of the prongs. This advertisement is from a 1952 Bar Mart Catalog. 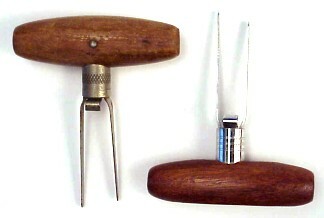 Two variations of the Gourmet with cap lifter.